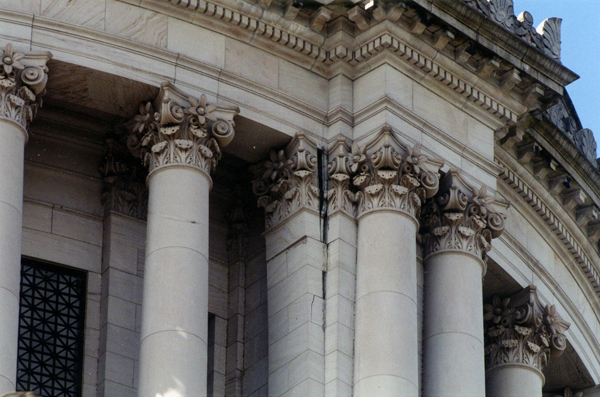 Fifteen years ago this week, the Legislature was forced to find a temporary home, courtesy of the Nisqually Earthquake. The magnitude 6.8 quake occurred late in the morning on Feb. 28, 2001, lasting about 45 seconds. The Legislature was in action that day when the tremor hit. The Senate was in the midst of Democratic and Republican Caucus meetings when the shaking began. Soon after it ended, legislators, staffers, lobbyists and visitors quickly and calmly (believe it or not) exited the Legislative Building and stood outside. (Fortunately, it was a mild, rain-free day.) Minutes later, word spread among the crowd that there was a crack on one of the pillars holding up the Capitol Dome. At that point, many thought that the same thing: If the quake had lasted a few seconds longer, the dome might have collapsed, resulting in devastation and tragedy. Senate floor session held in a committee room in the John A. Cherberg Building after the Nisqually Earthquake forced the closure of the Legislative Building. The Legislature shut down for the rest of that week while damage to Capitol Campus buildings was assessed. By Monday, the House and Senate resumed activity, but not in the Legislative Building, which was declared unsafe and off-limits. 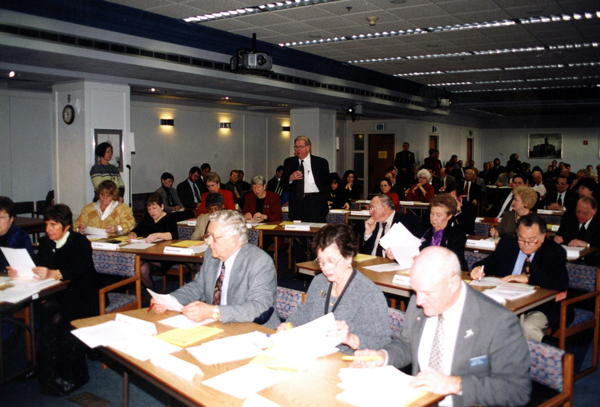 The Senate held floor sessions for the rest of the 2001 regular session in a committee room in the John A. Cherberg Building, while the House did likewise in the John L. O’Brien Building.